According to Tokyo Electric Power Company (Tepco), radiation levels of eight Sieverts per hour (Sv/h) have been discovered within the Fukushima nuclear power plant, which was destroyed after a massive earthquake and a tsunami in March 2011. Tepco, the company that operated the plant and is now tasked with decommissioning it, reported the discovery after making observations in a reactor containment vessel last month. Eight Sv/h of radiation, if absorbed at once, mean certain death, even with quick treatment. One Sv/h is likely to cause sickness and 5.5 Sv/h will result in a high chance of developing cancer. While 8 Sv/h is deadly, outside of Fukushima’s Reactor Number 2 foundations of a much higher level of 42 Sv/h was detected. A strange occurrence, and experts are still arguing what caused the discrepancy. One possible explanation is that cooling water washed radioactive material off debris, taking it somewhere else. 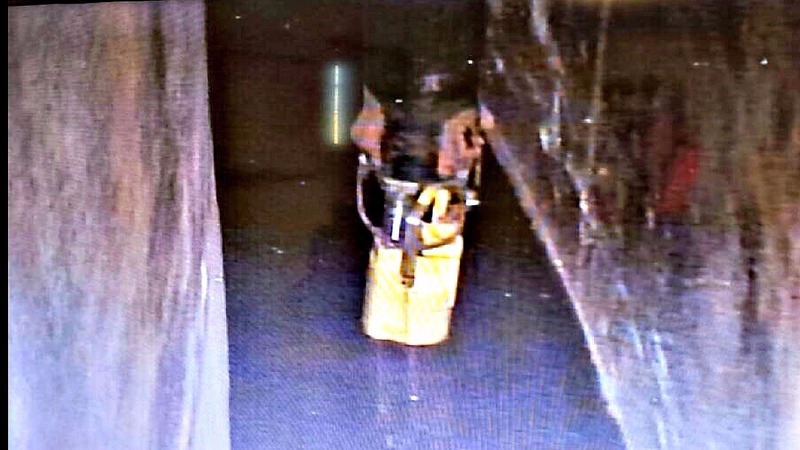 But here’s a truly terrifying catch: according to the report, Tepco highly doubts the new readings, because, as was discovered later, a cover was not removed from the robot-mounted measurement device at the time of the inspection, NHK World reports. Exactly one year ago, Sputnik reported that Tepco engineers discovered absolutely insane levels of radiation of about 530 Sv/h within the reactor. Such levels of radiation would kill a human within seconds. By comparison, the Chernobyl reactor reads 34 Sv/h radiation level, enough to kill a human after 20 minutes of exposure. The levels of radiation within Fukushima reactor number 2 were so high that Tepco’s toughest robot, designed to withstand 1000 Sv/h of radiation, had to be pulled out, as it started glitching due to high radiation levels. Nuclear experts called the radiation levels “unimaginable” at the time. On November 2017, the New York Times and other news outlets reported a much smaller figure of 70 Sv/h of radiation, more or less on par with a 74 Sv/h reading gathered before an anomalous 530 Sv/h spike. While that radiation dosimeter cover negligence prevents precise calculations, the actual picture inside Unit 2 is thought to be much worse. Japanese state broadcaster NHK World quoted experts saying that if the cleaning of the stricken power plant is not properly addressed, it will result in major leak of radioactivity with “global” consequences. Mycle Schneider, independent energy consultant and lead author of the World Nuclear Industry Status Report, criticized Tepco, saying the power company has “no clue” what it is doing. In observing the poor maintenance of plant radiation leaks, Schneider also pointed out that the company stores nuclear waste at the site in an inappropriate way. A leak in a massive nuclear waste storage tank at the Hanford Site has expanded significantly, KING 5 learned this weekend. Geffre is the worker who first discovered that the tank, known as AY-102, was failing in 2011. In a 2013 series, “Hanford’s Dirty Secrets,” the KING 5 Investigators exposed that the government contractor in charge of the tanks, Washington River Protection Solutions (WRPS), ignored Geffre’s findings for nearly a year. The company finally admitted the problem in 2012. Until now, the leak found by Geffre was very slow. The liquid would almost immediately dry up, leaving a salt-like substance on the floor of the two-foot space between the tank’s walls, called the annulus. Approximately three weeks ago, work began to pump out the contents of AY-102, which has the capacity to hold one million gallons of the deadly waste. The state of Washington has been pressuring the federal government, which owns Hanford, to pump out AY-102 for three-and-a-half years because of the cracking and slow leaking discovered by Geffre in 2011. Sources told KING the disturbance caused by the pumping must have exacerbated the leak: essentially blowing a hole in the aging tank allowing the material to leak more quickly into the outer shell. Tank AY-102 is one of 28 double-shell tanks at Hanford (there are 177 underground tanks total) holding nuclear byproducts from nearly four decades of plutonium production on the Hanford Nuclear Site, located near Richland. Initially the plutonium was used to fuel the bombed dropped on Nagasaki, Japan, in World War II. Plutonium production continued throughout the Cold War. Since 1989 the work at Hanford has focused solely on cleanup – the most difficult being getting rid of the liquid waste left behind that threatens the health of people, wildlife and the environment, including the nearby Columbia River. The new leak poses problems on several fronts. The outer shell of AY-102 does not have the exhaust or filtration system needed to keep the dangerous gases created by the waste in check. Workers have been ordered to wear full respiratory safety gear in the area, but the risk remains. In addition, the breakdown calls into question the viability of three other double-shell tanks at Hanford that have the exact design of AY-102. The accumulation of waste in the outer shell also means the deadliest substance on earth is that much closer to the ground surrounding the tank. And currently there is no viable plan in place to take care of it. The U.S. Department of Energy (DOE) and Hanford tank farms contractor Washington River Protection Solutions (WRPS) are evaluating recently identified, anticipated changes in the amount of waste between the inner and outer shells (the annulus) of Hanford double-shell tank AY-102. Since March 3, DOE and WRPS have been retrieving waste from Tank AY-102, and to date approximately 95 percent of the material has been retrieved. Early on the morning of April 17, crews identified an increase in the waste level in the tank’s annulus. Early on the morning of April 18, a slight decrease in the height of the waste in the annulus was detected. Out of an abundance of caution, DOE and WRPS are in the process of evaluating the tank’s condition. DOE and WRPS are committed to ensuring the safety of the Hanford workforce, the public and the environment. RICHLAND – An alarm was activated on Sunday, April 17, at the Hanford Nuclear Reservation while crews working for the U.S. Department of Energy were pumping waste out of the double-shell tank AY-102. There is no indication of waste leaking into the environment or risk to the public at this time. The Department of Energy notified the Washington Department of Ecology that the leak detector alarm went off. The alarm indicates an increase in waste seeping from the primary tank into the space between the primary and secondary tank, known as the annulus. Crews have been actively removing waste from AY-102 since March because mixed radioactive and chemical waste had previously leaked into the secondary containment area. Approximately 20,000 gallons of waste remains from the original 800,000 gallons in the tank. According to the Department of Energy, the removal work is currently on hold while engineers evaluate the situation and prepare a plan to recover the material that leaked between the two walls of the tank. This morning, an Ecology Nuclear Waste Program engineer assessed the situation with the Department of Energy waste retrieval engineers to assure that contingency response plans are being followed. Additional leaking into the annulus was a known possibility during pumping and is addressed in the Department of Energy’s contingency plan that was submitted to Ecology as part of a Settlement Agreement. That plan delineates actions for Energy to take. Ecology continues to monitor the situation as spelled out in the settlement agreement that directs waste retrieval. There are 28 double-shell tanks at the Hanford site.